An American animator, film producer, director, screenwriter, voice actor, entrepreneur, entertainer, international icon, and philanthropist hardly needs an introduction. An icon of the 20th Century. 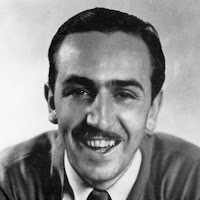 He co founded the Walt Disney Productions (now The Walt Disney Company) which became one of the best-known motion picture producers in the world with his brother Roy Disney. He, with his staff, created some of the world's most well-known fictional characters including Mickey Mouse (Disney provided the original voice). Walt Disney was born on December 5, 1901 to Irish-Canadian father Elias Disney and Flora Call Disney. His great-grandfather, Arundel Elias Disney, had emigrated from Gowran, County Kilkenny, Ireland where he was born in 1801. He began a series of businesses and eventually set up an animation studio with his brother Roy. In 1932, Disney received a special Academy Award for the creation of the series "Mickey Mouse. Snow White: When the film industry learned of Disney's plans to produce an animated feature-length version of Snow White, they nicknamed it "Disney's Folly" and were certain it would destroy the Disney Studio. Both Walt's wife Lillian and brother Roy tried to talk him out of the project. The film became the most successful motion picture of 1938 and earned over $8 million on its initial release, the equivalent of over $130 million today. He died in December 15, 1966 from lung cancer in Burbank, California. The last thing he reportedly wrote before his death was the name of actor Kurt Russell, the significance of which remains a mystery, even to Russell. "As long as there is imagination left in the world, Disneyland will never be complete."